Car Mechanics and Carpentry, only the Bedo gives this . Can't believe I'm using wood glue and clamps to fix the bonnet! Anyone know what size carb jets I should upgrade to? The replacement engine in the Shedouin is running a bit flat at wot. Can anyone advise on the best size, and is it both primary and secondary main or just one of them? And, how can I tell what is already in there, are they marked? 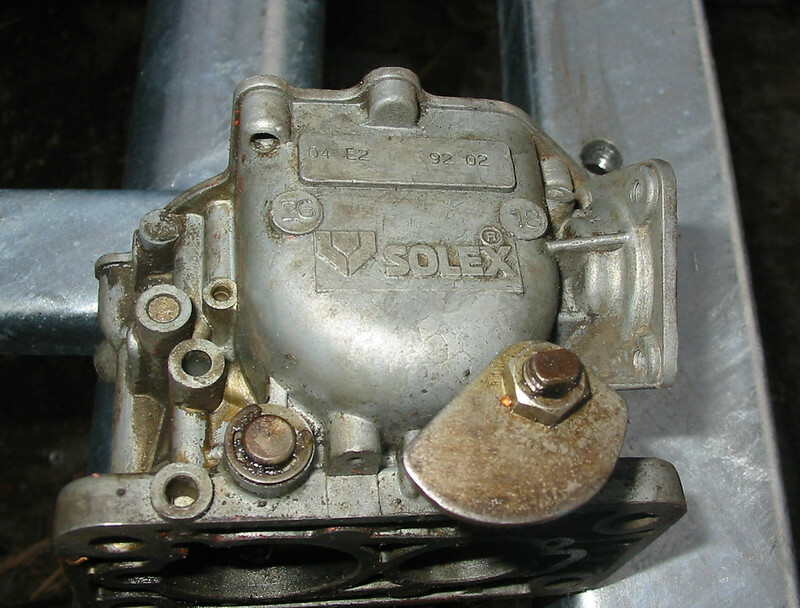 first step is to identify which version of the 26/35 Solex you've got, 21-24 or 18-26. The numbers are cast into the outer face of the offside (UK) float bowl. It doesn't have a 'blower' front cowling fitted at the moment, but does have the airbox moved to the side. I have the Dyane rubber carb to airbox hose. I also have the hose that would attach airbox to blower in place. So perhaps a suggestion for both with and without blower. I also have a burton 652 kit sat on the shelf. That has jets in the kit. These appears to be 110 and 115 . I also have a 24-21 carb on the shelf that I may be able to use a jet from. Suggestions for all three would be great. Oh ... and float height! I set tappets. Checked for air leaks and put a bit of grease around the heads/inlet manifold. Changed the primary main jet to the 110 from the 652 kit. Set the float height to 18mm. Big improvement. Not sure what the fuel consumption will be like though. apologies for the slow response, but it's been busier than usual here. An order list with six AKS400 chassis in it hasn't helped in that respect, since those blighters take almost three times longer to put together than a standard disc braker. Anyhow, here's what I've used, without any problems, for 602 engines fitted with an 18-26 version of the 26/35 Solex. 602 with blower; 110 primary, secondary 90, or 92.5/95 if the customer was willing to forgo some 'mpg' for a shade more 'mph'. 652 with blower:; Haven't done one of those yet, but there's a 652 waiting to go into my old Dyane and can't see any reason why I'd alter the jetting from that which has worked so well with a 602. FWIW, both Pete Sparrow and I reckon that the jets supplied by Burton with their 652 kit are too large. Of course, that's one way of keeping operating temperatures lower, however not only would fuel consumption be increased, but peak power may well be reduced. p.s. The 21-24 version will have a 120 or 125 primary and a 70 secondary, none of which are of any use in an 18-26 unless you're setting the Beduino for racing, in which the throttle would become an 'on/off' switch. However, they'd both need drilling out for that use.